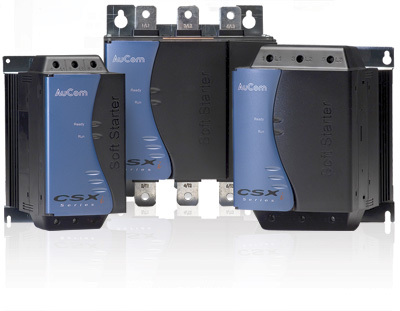 CSXi compact soft starters are a comprehensive motor starting and protection solution. These compact, reliable starters provide the latest constant current start technology and robust TVR soft stop, to reduce electrical and mechanical stress on your motor. The CSXi also incorporates essential motor protection functions to safeguard your motor during operation. The CSXi soft starter's small size and integrated bypass relays make installation easy, and allow the soft starter to fit in compact enclosures with limited ventilation. Rotary switches simplify configuration, and remote display and communication options allow trouble-free integration into common control networks.